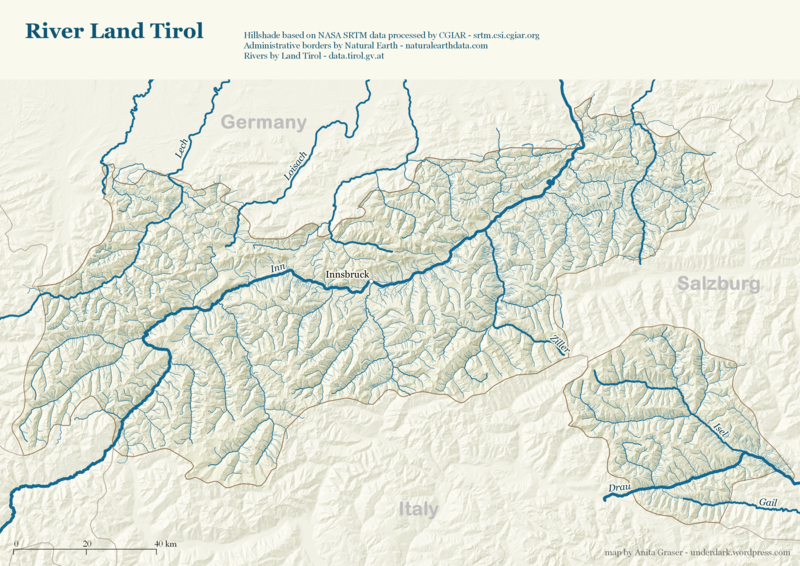 This post explores some cartographic features of QGIS while mapping the river network of Tirol, Austria. All data used is freely available. 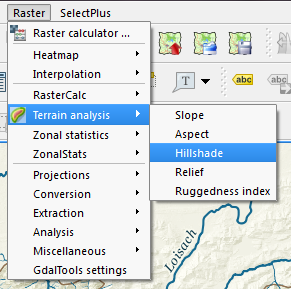 For the background, I downloaded NASA SRTM elevation data from CGIAR-CSI and created a hillshade using Terrain Analysis tools in QGIS 1.8. To emphasize both state borders and the fact that Tirol consists of two separate areas, I created a mask using the Difference tool and styled it a transparent white. Labels of neighboring areas together with map title, descriptions and scale bar were added in Print Composer. Working with Print Composer, it is useful to know that you can use Copy&Paste to duplicate map components and right-click to lock them from being moved. Also, every new component by default comes with a black outline and white background which can (and should) be disabled/changed in “General options”. Thanks for posting this useful example. 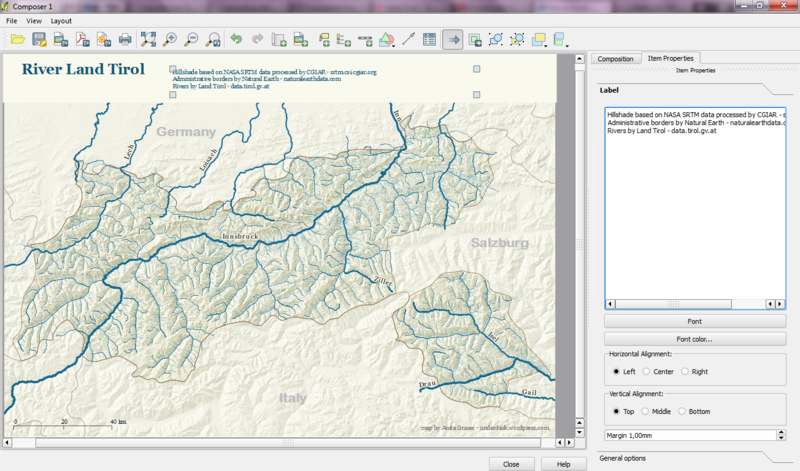 qGIS is very useful and powerful. 1) Why don’t you use the same colour for river names as for their streams? 2) Typing Italy and Salzburg might be misleading – administratively they are not the same units, shouldn’t they use different fonts? And one more: 3) Do you think it would be possible to create a river stream which gains width along its way? I mean rivers are usually much narrower on their beginnings, then their width increases and the estuary should be the widest part, right? 1) I had the impression that the river color was a little too light to be comfortably readable when viewing the whole page on (my 11′) screen. 3) As far as I know, that would only be possible by splitting the features. Maybe it would also be possible to write a special river renderer. That special river renderer might be really useful tool. Although how many parts would one need to create smooth river stream? It can get quite tricky I think. Re point 3) River width is a function of depth of flow (m3/sec) which depends on the side slopes and the velocity of the flow at any specific point on the watercourse. Accordingly width of flow will vary continuously. Nice post. I had one doubt though: what styling did you use for hillshade? A simple hill shade creation will give the output in grayscale. I applied a simple two-color colormap from light yellow to a darker yellow/brown to the hillshade. Hello and thanks for these usefull explanations. It should be pre-installed but you might have to activate it in Plugin Manager. found ! thank you ! Your data is fine. SRTM rasters consist only of one band. In this band, every raster cell has a height value. Also, rasters don’t have attribute tables.